Not too good of a week. I didn’t lose any weight and although I’m trying to stay positive this has really taken the wind out of my sails. I had become used to not having a good week but still managing to lose something, even if it was only 1/2 lb! A new week with a clean slate. Onwards and upwards! A week has passed since my first Weight Watcher’s Wednesday post. Such high hopes I had last week! This week has been tough! I have been struggling with insane, out of control snacking and hunger issues. Well, they’re actually more snacking issues than anything else. Around 4 pm I get these urges that I am struggling to control! It doesn’t matter what I eat for lunch, around 4pm I need to snack! At the meeting this morning is was great to hear that I am not the only one that struggles w/ 4pm!! A friend also mentioned that she struggles around 4pm because she is tired. I usually eat a pretty decent lunch so it’s not really hunger just an attack of the munchies!! Another thing I noticed when I looked back at my online tracker was that I have started eating carbs again. Although I never gave them up completely I had eliminated them from my supper. Slowly over the past couple of weeks rice, pasta and potatoes have been sneaking back in. So a humble goal this week. To keep my snacking under control. The agreement at the meeting was to keep zero/low pro points foods ready and available. I’ve picked up a bunch of low pro points snacks, salty ones as that’s what it appears I’m craving. Lots of fruits and veggies. I didn’t buy any potatoes but still have rice and pasta in the house. Keeping fingers crossed that I am able to stay away from those! Last week I made a Rick Stein recipe. It was good but next time I make it I’m going to change it up a little bit. 250g small clams, such as carpetshell, washed couldn’t find clams so I left them out. 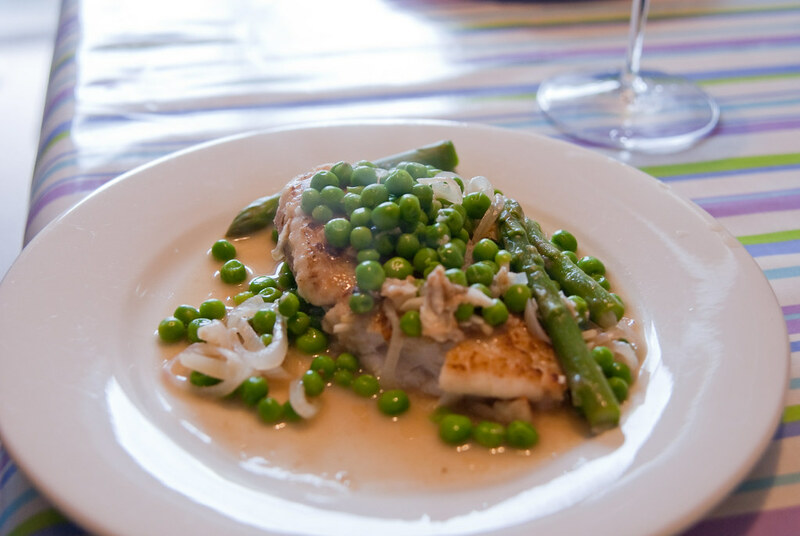 Season the pieces of hake generously on both sides with salt and set aside for 10–15 minutes. Meanwhile, drop the asparagus tips into a pan of well-salted water and cook for 2 minutes until just tender. Add the peas, bring back to the boil, drain and refresh under running cold water. Leave to drain. Dust the hake steaks in fl our and shake off the excess. Heat 12 low cal olive oil spray in a large frying pan over a medium-high heat. Add the hake and fry for 2–3 minutes on each side until golden brown on the outside but not quite cooked through. Lift out onto a plate and set to one side; wipe the pan clean. Add the remaining 12 sprays of low cal oil and the garlic and shallots to the pan and fry over a medium heat for 3 minutes or until soft and lightly golden. Stir in the tablespoon of fl our, then gradually stir in the wine and stock to make a smooth sauce. Bring to a simmer, return the hake to the pan and cook for 1 minute. Add the clams, cover and cook for 2–3 minutes until all the clams have opened and the fi sh is cooked through. Uncover and scatter over the asparagus tips, peas and parsley. Simmer for a minute or two more until the vegetables have heated through. Taste the sauce, adjust the seasoning to taste, and serve. We loved this recipe. As you can see I did tweak it a bit and I don’t think it lost anything for it. Well except for the clams but they’re hard to come by and would rather leave it out than use a substandard clam. This recipe was 15 pp total or 8pp per serving. I think next time I make it I’m going to swap the peas for sugar snap or green beans. Saving 3 pp per serving! Keep at it. I’ve stayed the same for 2 weeks now. The fish looks delicious. I’ve tried a couple of new WW recipes this week and all in work have enjoyed tasting. First up was the Broad Bean Risotto from Your Week about 5 weeks ago. 9PP/serving. I added a lump of frozen spinach and finely sliced carrot. Last night I knocked up the Lemon Curd Cake from the website at 6PP/serving. Put it together this morning to take into work. Half a portion at 3PP would be ample but I ate it all as so yummy.